While literally hundreds of books exist on the subject of "cartographic" maps, The Art of Illustrated Maps is the first book EVER to fully explore the world of conceptual, "imaginative" mapping. 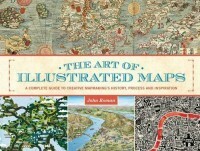 Author John Roman refers to illustrated maps as "the creative nonfiction of cartography," and his book reveals how and why the human mind instinctively recognizes and accepts the artistic license evoked by this unique art form. Drawing from numerous references, The Art of Illustrated Maps traces the 2000-year history of a specialized branch of illustration that historians claim to be "the oldest variety of primitive art." This book features the dynamic works of many professional map artists from around the world and documents the creative process as well as the inspirations behind contemporary, 21st-century illustrated maps. Altpick.com member and illustrator, Aaron Meshon's maps have been included in the book. Congratulations!